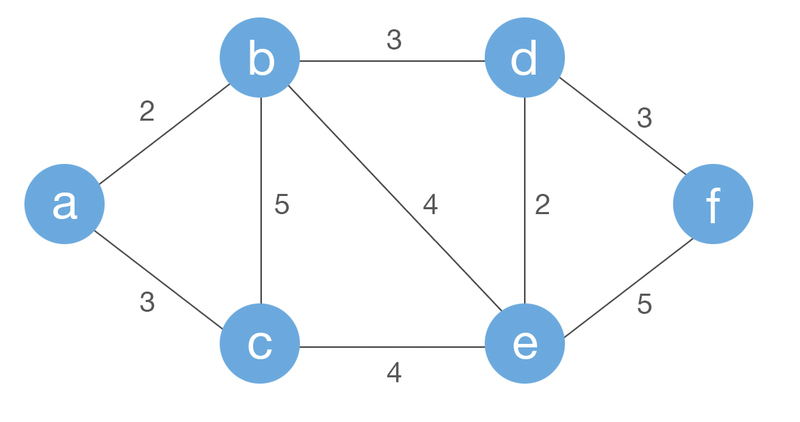 A minimum spanning tree of a graph is a subgraph that connects all vertices in the graph with a minimum total weight for the edges. Each edge between the vertices has a weight corresponding to it and your goal is to connect every vertex while minimizing the total edge weight. Graphs can have more than one minimum spanning tree. Below is an example of a graph with 5 vertices and weighted edges that we will be running Prim's algorithm on. (1) Create an empty tree, M, which will act as the MST. (2) Choose a random vertex v from the graph. (3) Add the edges that are connected to v into some data structure E. (4) Find the edge in E with the minimum weight, and add this edge to M. Now, make v equal to the other vertex in the edge and repeat from step 3. This algorithm runs until the number of edges in MST is equal to the number of vertices in the graph minus 1. So in the example below, the number of vertices in the graph is 6, so Prim's algorithm will run until the MST contains 5 edges. Once the algorithm is complete, the MST will have successfully connected all vertices in the graph with the minimum weighted edges. (1) Store the edges in an array and search through it each time to find the edge with the smallest weight. (2) Store the edges in a binary heap which improves the running time because edges can be found faster. The implementation below uses method (1). 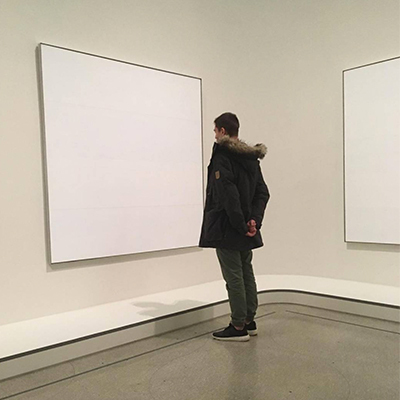 It first converts the graph into a matrix and then on each iteration of Prim's algorithm, it adds edges to an array which is then searched through linearly to find the edge with the smallest weight. If there is a tie between edge weights, it simply chooses the first edge it encounters. Because we are using implementation (1) to store the edges and we are representing the graph as an adjacency matrix, the running time is O(|V|2) where V is the number of vertices the graph contains. This is because in the worst case, when we add a new vertex to the MST and we store its edges, the edge with the smallest weight might be at the end of the list requiring us to loop through the entire array of edges. This makes the running time V * V = V2 where the first V represents every vertex in the graph that is being looped through in the while loop and the second V represents every other vertex that the first vertex may be connected to in the graph via an edge.